AdMarkan will be on "holiday" mode until Monday August 25th. There will be no interruption to weekly reports on this blog. Please read the ER2 post also. Both symbols are undoubtedly correlated yet each has its specificities. ES went up to 1291 (for a 1295 target and now is retracing to 1250 and possibly below. So, all in all we've had a very easy week for ES. MTFS certainly follows price action therefore indicates a lower support. Entropy however is not so bearish hence ES may congest around 1250 or slightly lower without breaking that level (1246). The Swing indicator announces a possible reversal with a first Fib target back to latest highs. We shall obviously wait for for the indicator to toggle up to confirm such scenario. This would be in line with some congestion at higher time frames. Again, following a ECO (early MTFS crossover) we knew there was little chance to see the recovery carrying through to higher levels and the 1st Fib retracement proved to be a profit taking level. IT would now make sense to test 1250 to be tested more firmly to go higher later on. We have however remain careful if this daily bar turns red. If we look at Entropy now, it seems that negative energy has almost dissipated. We don't however see ES bounce straight away but a Fib pattern may form later on this week. Weekly: Caution must be exercised. No change really... Bars are still red, MTFS still fairly bearish and Entropy has not bottomed yet! It is therefore far too early to rejoice so we'll remain cautious and check on support levels. We can still assume that 1230 will hold. Next Fib level is way down at 1100 but we'll avoid falling into pessimism and wait for a possible yellow bar and maybe a pivot coming in the next few weeks. In any case, no recovery potential in sight in the short term. Options (RUT): no change in outlook for August, i.e. condor outside the 625-750 range. On ER2, last weekly post mentioned tightening stops on the long which incidently reached target at 725 (Fib, just above SR). Most would have tried a short which may take a little longer to materialise. We do notice that the 60mins is no longer a significant time frame, so we'll switch to a lower time frame to follow our trade while keeping in mind the daily and weekly contradictory charts. EURUSD: No major change: there will only be a chance of significant recovery if the US$ passes 1.5625. Prices have been contained in a trading range. Prices left SR to reach 700 so to our surprise a little higher than Fib PR1. We have kept an eye on EURUSD which almost hit the target 1.5625 level (mentioned several times on previous posts), but we do notice correlation is not as clear as it used to be. MTFS lines seem to ge their own way indicating possible congestion and Entropy is not helping either. We will therefore limit our analysis to pure price patterns and follow a likely Fib pattern to 700 and lower. No significant drop to expect, unless volatility increases on account of lower volumes. ER2 reached clear Fib targets (719 for the retracement, 725 for the previous Fib expansion), and looking now at taking a breather. The early MTFS crossover (ECO) and peaking Entropy should normally allow ER2 to retrace to the 790s. No indication at this stage that ER2 will retrace lower yet 688 is also a possible target. For the 2rd time now, MM stall level seems to have broken the fall, and one might think that a reversal is in the cards. Yet, MTFS and Entropy look if not bearish at least congestive so one should certainly not expect a strong rebound before the negative pressure is dissipated. Further to what was said last week, the last bounce looks like it was short-lived and last lows (stall level) or the Fib target around 625 can still be hit within a few weeks and without any significant exogenous shock to the market. One shall therefore remain fairly cautious as one should always be when Swings are in a DN-UP-DN configuration. Last week was fairly classic and unsurprising with ES rising very close to our target then retracing back to major support. For details, a copy of last week's AdMarkAn posts is now available on request. Today's report will be posted shortly. We indeed saw the channel breakout as mentioned on the last weekly post, to see prices settle a little higher. 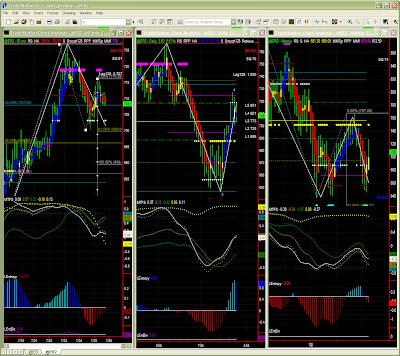 Indeed lower intraday time frames showed clearer pattern and possible Fib target up to 1270. Swing is now UP and MTFS isn't looking too shabby with a pattern indicating some exhaustion in the short term but clearly some steam left in the green line. This is typical of a stall but can generally take prices higher. This stall is also visible in Entropy weakening fast. ES should therefore remain contained in a fairly narrow trading range. More interesting maybe is how MM levels have evolved. 1250 is now clearly a pivot level, and despite the overall up move in the last week or so, SS is now significantly lower. We shall therefore again take cues from lower time frames to check ES behaviour around pivot level as we might see some retracement at the end of the current congestion period. We already had an early MTFS crossover last week, so we anticipated a bottom, and even a bounce on Fib/MM support levels. We now have a more positive outlook with ablue bar, lines sloping upward, bottoming out entropy etc so ES should certainly be looking at going up possibly to Fib PR1 (38.2%). Now the only caveat is again the early crossover so one could either be long with a stop below 1230 or maybe try to find a better entry point anticipating a pullback still. Looking at the overall picture, i would tend to opt for the second scenario. Again we see that Fib target level here similar to the one on the 60mins chart. We last week mentioned a bit of fighting on those levels and despite a possible 1100 Fib target, a quick look at our symbols seemed to provide enough reassurance that current bottom would hold. 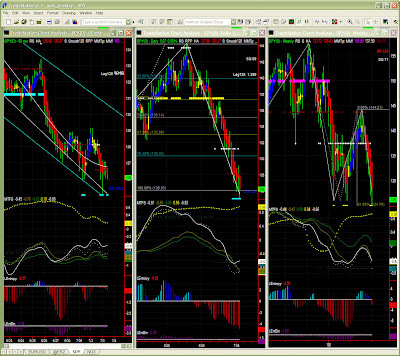 A week later, one can say that this scenario looks valid bt we're not out of the woodds just yet. We will remain cautious and above all refrain from turning bullish already. 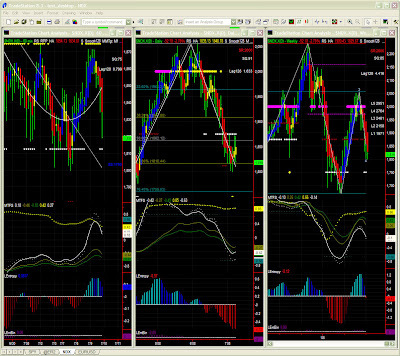 The Fib pattern is still there and MTFS still looks quite bearish. We will wait for at least a yellow bar above 1250 to confirm the fall is over. This means that despite positive signals in shorter time frames, there is still no strong recovery potential at this stage. On ER2, last weekly post indicated exiting shorts but not going long just yet (following our time frames and market outlook). We indeed saw a bottom being confirmed and even some attempt to go higher. Looking at intraday time frames, some would understandably have gone long last week. All in all, last post again didn't do too badly. What next now? EURUSD: There will only be a chance of significant recovery if the US$ passes 1.5625, so fairly weak and directionless still. We'll obviously also keep an eye on oil prices and further consequences of the subprimes blunder. We indeed saw ER2 passing the MM pivot level briefly to hit a Fib target but there was not energy to carry prices much higher. Hitting 700 was even a bit of a stretch. MTFS is pointing for a mild erosion and MM level turned to Strong Resistance. There is still a vague chance that SR holds as support but this is unlikely. One would rather anticipate ER2 to find some support on a lower Fib retracement level. There is however no indication of a reversal (we don't even have a single red bar) so prices shall not reach recent lows again. Despite the early MTFS line crossover, we now have a positive outlook on ER2 with lines pointing upward. Entropy is also looking healthier now. One might have entered long last week from lower time frames (i however purposely only give a market outlook and no trading signals per se). Stops would be tightened now. For the 2rd time now, MM stall level seems to have broken the fall, and one might think that a reversal is in the cards. Yet, MTFS and Entropy look if not bearish at least congestive so one should certainly not expect a strong rebound before the negative pressure is dissipated. Furthermore, as all 3 time frames weigh equally now, the latest bounce may only be a reprieve and the Fib target around 625 can still be hit within a few weeks and without any significant exogenous shock to the market. One shall therefore remain fairly cautious as one should always be when Swings are in a DN-UP-DN configuration. Monday's post will be posted shortly. You will have noticed that this public blog now only publishes weekly snapshots. And please don't forget my 2 cents of advice: there is also a life out there. Please read the ER2 post also. We have seen ES test the 2nd Fib target during the course of the day, thanks to jitters on FANNIE MAE and FREDDIE MAC. The market would have otherwise settled on the 1st target close to MM support. One can see that 1250 is actually holding, but we have no assistance from our indicators (significance level is low at this time frame). We shall therefore like for ER2 either follow pure price patterns or switch to lower time frames for entry/exit points. The Swing indicator could toggle up during the course of the day, but we shall first focus on the current channel and a possible breakout on the upside. Daily: Congestion. No rejoicing just yet. MTFS lines are diverging indicating an attempt to break the fall. The early line crossover indicates a recovery attempt which has only one chance of materialising: the green line must start going up before the white line gives up. We shall therefore be careful still. Some will take profits on their shorts or portions thereof, but it is way too early to go long now. ES must now stay above 1250 for a while, and even test the level for support again to have any hope for a recovery. We have a Fib target level here similar to the one on the 60mins chart. We can anticipate further fighting on this level but the overall mood remains bearish. Obviously the next Fib target down is around 1100 which would be a disaster to an already battered market. Looking at other symbols, it looks like market participants will try and keep ES above water for now. We will however remain very cautious as we have NO indication of any sort recovery just yet. EURUSD: we'll keep an eye at EURUSD not breaking the current lows as this would bring further turmoil to the markets and obviously impact our outlook here. 60mins: congestion, erratic. Shorter time frame recommended. Same advice as last Friday, i.e. not much to read from indicators at this time frame. This means that one shall either follow pure price patterns or switch to lower time frames for entry/exit points. 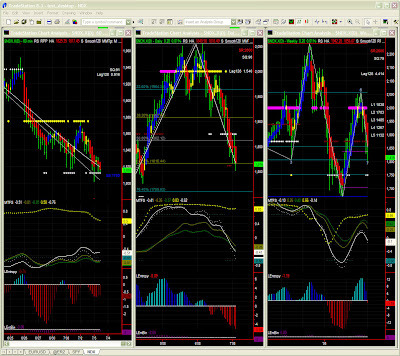 Reaching 2nd Fib target level is quite possible. Daily: congestion with upper bias at first. MTFS lines are diverging indicating an attempt to break the fall. No recovery can succeed with a green line sloping down and crossover came too early. Having said that, ER2 could well reach the 60mins Fib target which is close to the MM pivot here. Conservative traders will have exited their shorts and won't go long just yet as there is still a lot of indecision here. NB: This is the last *FREE* daily snapshot for ER2. Swings: DN-DN-DN (from DN-DN-DN). 60mins Swing is close to toggling up. 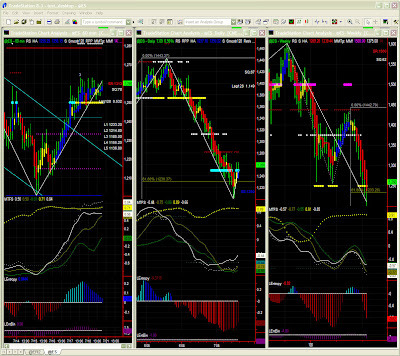 Market Direction (daily): congestion to possibly lower still. 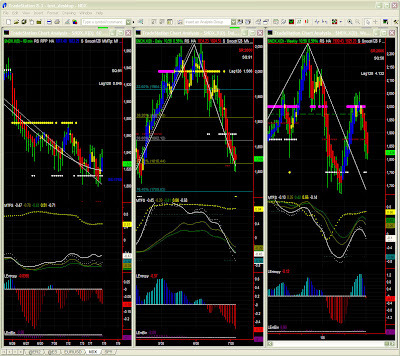 Note on EURUSD: same fairly directionless [1.5625-1.57.47] trading range. 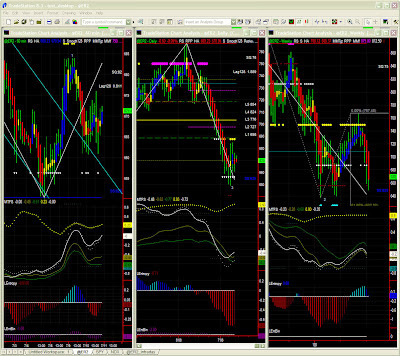 Shorter intraday time frames are recommended. Significance level is now quite low, so again one should switch to lower intraday time frame to play reaction on MM support level. We are certainly in "danger zone" as 125 could break to go substantially lower! As mentioned already, it was obvious the bounce would be short-lived, but the last bar is so bearish that we shall be careful at this level too. One should not panic however as MTFS white line is rather showing possible congestion. The other MTFS lines are certainly also very oversold, so 125 could well be penetrated even deeply without breaking completely. 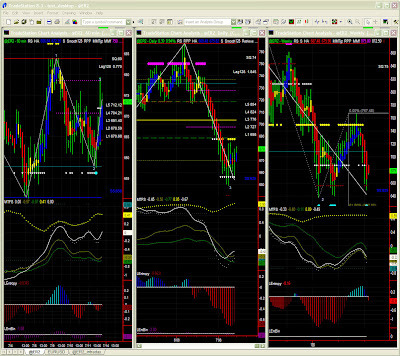 We've shown that bearish Fib pattern expansion for a while now so what next? 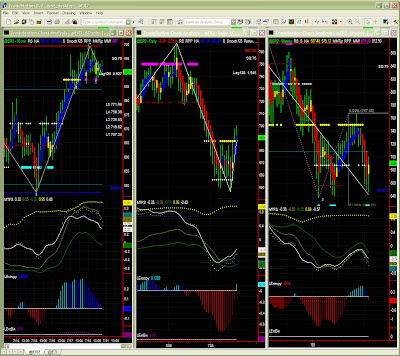 A combination of a MM pivot and a Fib target generally provides enough support to enter a congestion period. Secondly, MTFS and Entropy are surprisingly not too bearish either. MTFS is still in "failed recovery mode" and Entropy is moderate in relative terms ((EntBin=-1). Yet, The Swing gradient or "real-time momentum" show a significant potential to take prices lower, possibly to the next Fib target level which is also a significant MM level, i.e. around 113. For the time being, we'll assume 125 will hold even if momentarily penetrated, but we will also remain cautious and place our puts below the next possible targets for safety. We'll also keep an eye on AccDist or another other volume based indicator in the next few weeks (earnings season again). cf. NDX post below for guidance. MM/Fib levels are obviously symbol specific. NB: AS THE SAYING (OR HEALTH WARNING) GOES, "FREE LUNCHES CAN MAKE YOU FAT" HENCE END OF DAILY SNAPSHOTS IS PROGRAMMED ON FRIDAY 11TH. IT WILL BE REPLACED BY A FREE WEEKLY OR MONTHLY MARKET OUTLOOK. PLEASE CONTACT ME FOR PERSONALISED MARKET ANALYSIS. cf. NDX post for guidance. 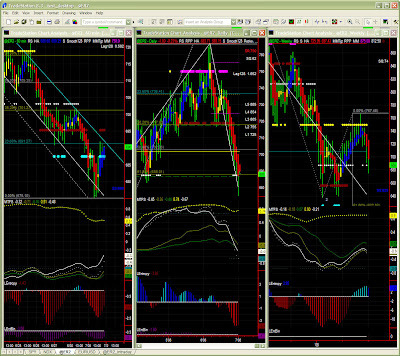 MM/Fib levels are however symbol specific. Yesterday's forecast for ER2 was again accurate with my recommendation to take profits and change to a lower time frame to take advantage of the bounce. This recommendation was also valid for NDX for which i gave a possible support around 1810 three days ago, and even warned short sellers to take profits then. NB: FREE daily snapshots will come to an end this coming Friday. Looking at lower time frames, NDX looks engaged into a recovery mode but that is not yet confirmed at this time frame where yersterday's up move may be little more than a short squeeze on support level. 1875 is now a very close target which could certainly be passed to reach a Fib PR1 retracement. MTFS and Entropy are not yet indicative of a significant recovery but that possibility can nonetheless not be discarded. On account of the average significance level, we will take cues from lower time frames (15mins). Good day yesterday, but certainly not enough to reverse the bear situation we're in for over a month. MTFS is nowhere near recovery mode, so one sould be in a congestion or at best a bounce to PR1. Having said that it may prove enough to stop the blodshed, hence a recovery is quite possible later in the months. 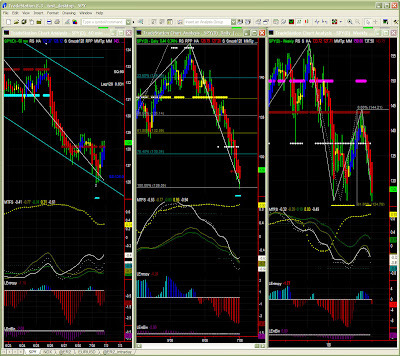 Weekly: Support to be confirmed still. Despite a good day yesterday, a 2.43% gain in a day is nothing extraordinary with NDX, so again there is little change in our outlook at this weekly level. The support level we may have seen on the daily chart still has to materialise here too. In the meantime the negative bias is certainly still visible. I said last time that MTFS despite showing a "failed recovery" pattern, was not quite indicative of a market fall just yet and we may indeed just enter a congestion period. On NDX yesterday, prices kept on drifting as anticipated and end quarter window dressing had little effet on the on going trend. Support will have to be found lower probably around 1820 ... or lower, i.e. right down to 1750. 60mins: aiming at the 125 "attractor"
Significance level is now quite low, so one should switch to lower intraday time frame to play reaction on MM support level. 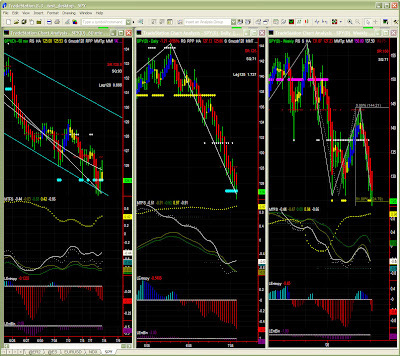 MTFS white line is showing possible congestion or even a short term bounce on key level. There is still a lot of negative pressure though so no rush to any sort of recovery. As mentioned previously, this is a crucial configuration as the current Fib pattern could well develop lower. One should not panic just yet even MTFS is not looking too good. This is not a classic bearish pattern, and we may just see a fairly long congestion period if 125 holds. That level could even be momentarily penetrated. Trading may just slow down now for July and August, so it may certainly take some time before SPY turns positive again. Yesterday's post on SPY proved correct again, with some support on stall level. It seems however that 125 acts as an attractor now. On ER2, last post was also correct, even if the 688 level has been penetrated quicker than anticipated (i warned on increased volatility). We are certainly going through a lot of tension on EURUSD and oil prices. We are even close to danger zone. 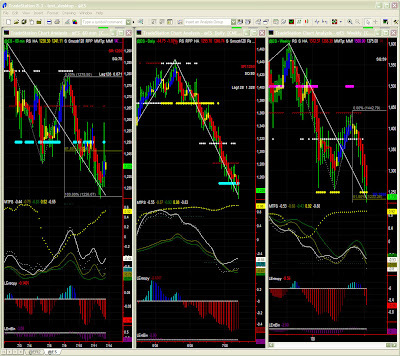 NB: you'll notice brown dots on MM indicator now also showing MM stall levels. We will therefore switch to a lower TF (15mins) to probably see a short term bounce (15mins TF) maybe up to a Fib retracement level (~700). No serious recovery in sight just yet, but we'll check for the channel breakout and the swing indicator toggling up. Obviously the bounce on yesterday's low gives some (limited) hope of a short term rebound, supported by a possible bottom on Entropy. Everything else is however still pointing south, so despite a possible congestion over the next few days, support will have to be lower. No major change from last post. As mentioned previously, we are now seeing the development of a down Fib pattern aiming straight at MM support level (~625). 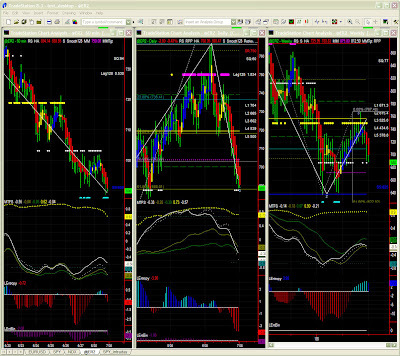 Since the MTFS pattern is not so bearish, the Fib pattern can however still fail. 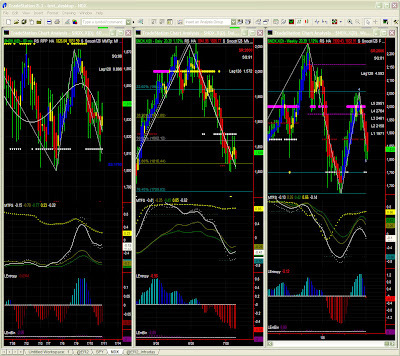 We will therefore also look for a possible support level along the way. On NDX yesterday, prices kept on drifting as anticipated and end quarter window dressing had little effet on the on going trend. Support will have to be found lower probably on 1820 ... or lower. 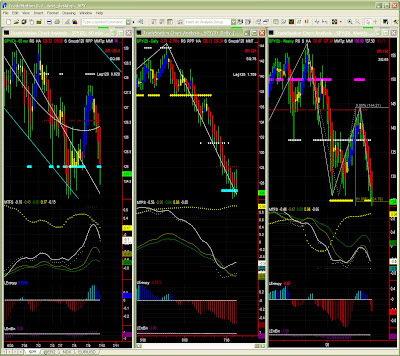 Back to SPY now: Last post was unclear on a support level and anticipated SPY going lower (target 128). To be honest, i thought the 130 area would contain prices in a trading range for at least a short while. It seems SPY is now aiming at 125 again. Note on EURUSD: we're near the upper boundary of the same trading range, which could certainly breakout sending US$ to new lows. We'll have to watch carefully the market reaction to the BCE decision this week. MM support level has dropped to 125, with a stall level around 128, i.e. near yesterday's lows. MTFS and Entropy point for a moderate recovery potential (EntBin is very low), so we may have a up day or some congestion, without any major change in the down trend visible just yet. Bars are still red, and every indicator is somewhat bearish so support will have to be found lower, to a possible 100% fib retracement, i.e. close to year lows. 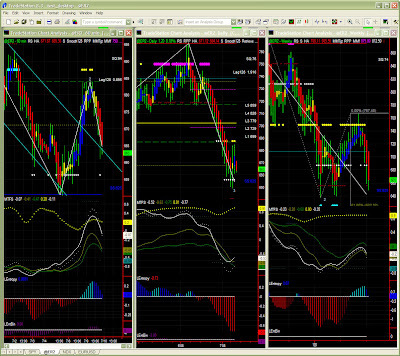 Our target is MM stall level just above 128. 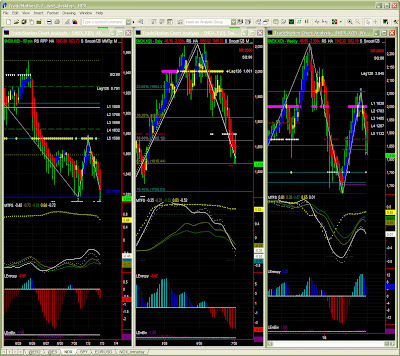 We also have a Fib target in the same area, then MM support at 125. This is indeed a crucial configuration as the last pivot point (144.30) is now developing into a full downward Fib pattern with a 125 target level at first (could go lower!!). MTFS indeed looks more and more like a failed recovery pattern, confirming this scenario mentioned several times over the last couple of weeks.